Ann Nocenti's Catwoman Vol. 5: Race of Thieves is not as strong as the previous volume, Gotham Underground, which was itself somewhat troubled. On its face Race of Thieves should have the upper hand, being at least a Catwoman-style heist story, instead of Gotham Underground's weird fantasy milieu. But, despite not really being a "Catwoman story," Underground's bizarre subterranean tribes and villains made it an interesting read in general; Race's more generic supervillain theatrics combined with Nocenti's trademark, but sometimes off-putting, leaps in logic make for a confusing and not very engaging volume. It bears mentioning that the very best part of Race of Thieves is guest writer Sholly Fisch's Futures End tie-in issue that finishes the book. Fisch's story is deceptively simple in that it involves just three or four set pieces, and functions mainly as a character study of crime boss Selina Kyle at the end of her career. Fisch sets the story in very familiar territory, with a talking gorilla straight out of Grant Morrison's future Batman stories, Tusk from Batman and Robin Vol. 5: The Big Burn, and iconic imagery from the Catwoman/Falcone feud, all the better to make this really feel like a tale of Selina's actual future (as opposed to the Superboy: Futures End story, which felt wholly divorced from Superboy proper). And Fisch wraps it all up in a long con, too. Fisch's story essentially bridges this Catwoman volume and Genevieve Valentine's revamped run to come, and the fact that Fisch's story rules the book demonstrates just how desperately the change is needed. Fisch's issue serves not just as a Futures End tie-in (though the story bears no relation to its own cover), but also references a scene from Batman Vol. 6: The Graveyard Shift, which is itself a flash-forward to Batman Eternal, making this Catwoman: Futures End issue a rare triple or quadruple tie-in. Fisch also has another one-off story in the book, which I found annoying at first because it's a one-off disconnected from the rest of the book, but in retrospect it's a good Catwoman/Batman caper that encapsulates well what a "classic" Catwoman story is more or less about. Nocenti's "Race of Thieves" story, which pits Catwoman against Roulette, formerly of JSA, and Flash rogues Mirror Master and Golden Glider, would seem to have a lot of potential, but it's filled with so many incongruous or ill-fitting moments that I couldn't really get into the story. That Selina suddenly has a job with a suicide crisis center makes sense in the context of the book's crossover with the Detective Comics Vol. 5: Gothtopia alternative universe, though it's nonsensical when it remains true after the fact (and later, Selina just promotes herself to a supervisory position and no one notices). Further, there's a scene in which Selina answers a phone call from a person in crisis. Even as Selina is wearing a headset and the different counselors sit in different cubicles, suddenly everyone is crowded around Selina, listening to the conversation. Selina seems to talk the person down and everyone is cheering in the background ... and then they all hear gunfire as if the person has killed herself. Only at that point does Selina go running out of the building, revealing she recognized the person's voice as her friend Gwen (as if saying, "Gwen, it's Selina," might not have been helpful before). Selina arrives and Gwen has shot her gun a handful of times at her wall -- for no reason ever really explained -- and not long after they're exploring another criminal heist. Not that fiction must always be hyper-realistic, but Nocenti's imagining of this crisis center is so simplistic as to be ridiculous, and further there's the entirely predictable moment when gunfire echoes over the phone line, Selina's decision to go to Gwen only after the gunfire, and the fact that all of it is ultimately inconsequential. Character traits come and go, like Selina retroactively knowing that the character Volt is an alcoholic, which takes a scene to establish and then never really affects the plot. There's a flashback to demonstrate how Selina can always spot a dirty cop ... in no way that's really explained other than that the cops act badly. The troubles go on: Selina says to another criminal, "I can see why they call you Swindle," when there's nothing "swindle-ous" the character is doing other than wearing a supervillain costume (this problem of characters knowing other characters' names that they couldn't possibly know was present in Gotham Underground, too). Roulette describes "3-Ds of crime" for her competition -- dexterity, deception, and disguise -- tests the criminals on the first, and then promptly forgets the rest. I'm glad that Selina's love interest from the last volume, Rat-Tail, appears, but how he gets halfway across the world and into a secret, exclusive villain competition is unclear. I also liked that the "race of thieves" was really just a cover for the story's underlying mystery -- there are elements here of the detective fiction and police fiction that Catwoman works well in -- but why exactly Roulette would telegraph her attempt to "gaslight" Catwoman through the use of actual gas lights, Riddler-esque, also doesn't make sense, nor why gaslighting villain Hunt Stone is always depicted as having his hair on fire when it's actually not. The book starts with a Batman: Zero Year tie-in by John Layman, who recently wrote one of the better of these in Detective Comics Vol. 5. The Catwoman story, however, lacked the ending twist I've come to expect from Layman's work and equally makes some leaps in logic, like Selina out-of-nowhere being handy with a whip, that I didn't think befit an origin story. I don't really like these Catwoman origins, of which there've been a couple, where Selina is kind of wishy-washy about becoming a thief, when we know she'll eventually be one anyway; the tougher young Selinas of Frank Miller's or Ed Brubaker's depictions are more how I imagine her. Catwoman is a series with a storied history, especially in regards to Ed Brubaker's work, and I really have high hopes for Genevieve Valentine's run to come. I don't think there was any debate really whether a change was needed, but Catwoman Vol. 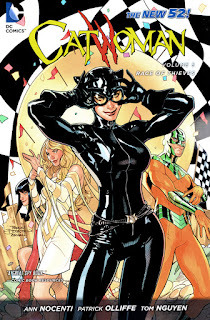 5: Race of Thieves sets the old Catwoman right beside the new, and the better direction is certainly clear. Hopefully Catwoman will be back to being a must-read book soon.